Photograph of the ruins at Brahmanabad in the Hyderabad District of Sind in Pakistan, taken by Henry Cousens in 1896-7. This is a general view of the site looking along the hillside. 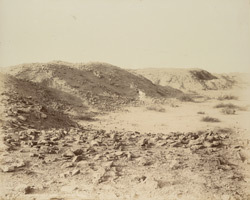 Cousens wrote in Brahmanabad-Mansura in Sind, Archaeological Survey of India, Annual Report 1903-04, "Perhaps the most interesting of deserted city sites in Western India is that usually known as Brahmanabad in Sind, situated about eight miles south-east of the railway station of Shahdadpur, and forty-three miles north-east of Hyderabad. It lies upon the open sandy plain, in rolling heaps of brick debris, scored and cross-scored with the depressions of its original streets, and engirdled by the ruins of its own massive walls and bastions. The plan of the site has very much the shape of an old top-boot, with the sole presented to the north-west, and the leg stretching towards the south-east end, the whole having a circuit of five and three-quarter miles. With the exception of a considerable area towards the south-east end, the whole space is covered with billowy mounds of brick ruins. Nothing stands now above the surface, save in one place, where an unrecognizable tower-like core of brick masonry, by its very loneliness, accentuates the utter desolation around. There is a total absence of stone masonry of any kind; but lumps of charred wood, here nad there, seem to indicate the former presence of wood-work. The cementing material in the brickwork would appear to have been mud; and it is this, the accumulation of ages, before the final downfall of the city, that forms the greater mass of the present mounds."